Journey back to WOMEX 14 in Santiago de Compostela with us! 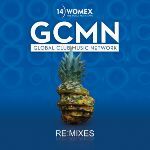 The Global Club Music Network (GCMN) and WOMEX are delighted to release the Remix EP of last year's WOMEXimizer. Remixed tracks from eight WOMEX 14 Showcase artists are featured on this compilation. DJ/Producer Kosta Kostov alongside Miriam L. Brenner and the whole GCMN team, has once again undertaken an extraordinary effort to put this together. A huge thank you to everyone involved in bringing this to life. The rapidly expanding Global Music Network (GCMN) is a worldwide collective consisting of professionals committed to presenting forms of (live) electronic dance music, rooted within the rich sounds of the globe. For the second year GCMN has actively engaged with WOMEX to present the highest quality of artists this genre has to offer: through their trade show stand which included a Silent Disco, official Network Sessions, and by supporting and participating in the DJ Summit. Cover artwork by the Cologne-based designer Andre Fritz.